HOW MUCH DOES A WEDDING IN BALI COST? If your thinking about having your wedding in Bali and want to know how much it costs, following is a great article that will explain and unveil all the costs associated with having a wedding in Bali. Bali’s is cheap but it isn’t that cheap. Sure your going to get more bang for your wedding dollar in Bali (especially if you have ever planned a wedding in Australia) but be prepared to pay for quality. Like any wedding ceremony and party, costs for a Bali wedding can vary greatly depending on where you decide to have it and what type of function you want to have and obviously the number of people attending. If you know your budget expect to have wedding based on that budget. The weddings that we organise at Your Bali Wedding start at AUD $15, 000 & for this your going to get something with a wow factor. But, costs can and do escalate depending on what your wanting for your wedding. Obviously, you can find cheaper wedding packages but then again you will have to compromise on the level of input from your wedding planner, as well as the venue and function. Like everything it all comes down to how much your willing to spend, but a a guideline $20,000 is a good start. Let’s put this into some perspective here. For a luxurious wedding in Australia you will be paying a lot more than this. Costs in some cases can be double. This is what makes Bali such an attractive place to have your wedding. It’s such good value! The only way ( you can try it yourself but be warned) of having a wedding in Bali is to go through an experienced Bali wedding planner. They will be able to customise a tailored wedding solution based on your budget. Some of the cheaper operators will have basic entry level wedding packages and other will cater to the other end of the market. Those with deeper pockets and who are will to spend a bit more. Prices of wedding packages will vary greatly so the trick here is to find a wedding planner that’s trusted, reliable, English speaking with a solid track record. Don’t just go with any old agency. Sure, there are heaps to choose from but don’t just go with the first person you see online. Be aware that some companies will advertsie extremely cheap wedding packages to get you signed up and start hitting you with extras once the deposit has been paid and your committed. Be prepared to do your due diligence and in some cases you may need to meet with the planner. If that seems like a drama, the next best thing is to Skype or Facetime them. If you do your homework up front and carefully scrutinise your options then your going to find the right fit for your wedding budget. The list is endless and will keep on growing as you delve deeper into thinking about your wedding. The 3 most obvious ones are the number of guests that will be attending, the wedding location and the reception. There is also the accommodation to think of but that’s for another point. If your planning to have a beach wedding or a villa wedding and intend to have 100 guests coming expect to pay more than a simple beach style wedding where there are only a small group of close friends or family. 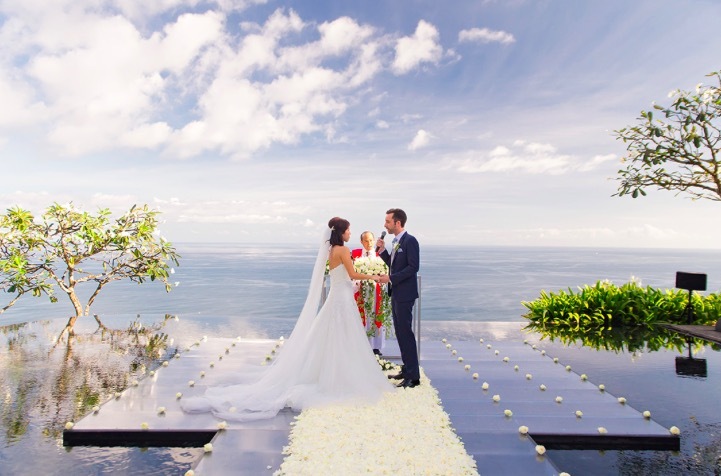 Bali has some amazing locations for your wedding so be open to some suggestions and ideas from your wedding organiser. If you decide to have your wedding in a beach front villa in Seminyak or Canggu or you would like to have it at a villa over looking the ocean at Uluwatu this can get pricey, depending on the villas facilities and time of year. Only your wedding planner can come up with options that are specific to your budget. The team at Your Bali Wedding has done this so many times and for so many years that we can easily help you plan everything seamlessly according to you style and budget. All we ask is that you are aware that there are certain factors that will escalate the cost of the wedding. It’s a case of demand and supply. If your planing to come to Bali during peak holiday periods to get married and want to spend your honeymoon in a villa for a week or so, then this will add to the costs. A good tip here is to plan your wedding outside peak holiday periods. Perhaps go for what is termed: shoulder holiday periods. If your constrained by holiday periods due to work commitments and combining everything with school holidays then this is another story and you just have to wear the expense. If you want an international DJ flown in from Europe for the day, this can be organised but it will cost. Most people will never go with this option but will want a decent wedding party with great food, music, ambiance, alcohol, flowers etc. This is where the budget becomes very handy. Know exactly how much your willing to spend, add a tiny bit of wriggle room just in case you want to add a few things and let your wedding team in Bali come up with a creative solution.